When Dominic Jones started out in 2009, he was a 23 year old with an inspiring talent and a brilliant idea that no one had thought of before. He wanted to create fine jewellery his generation could afford. 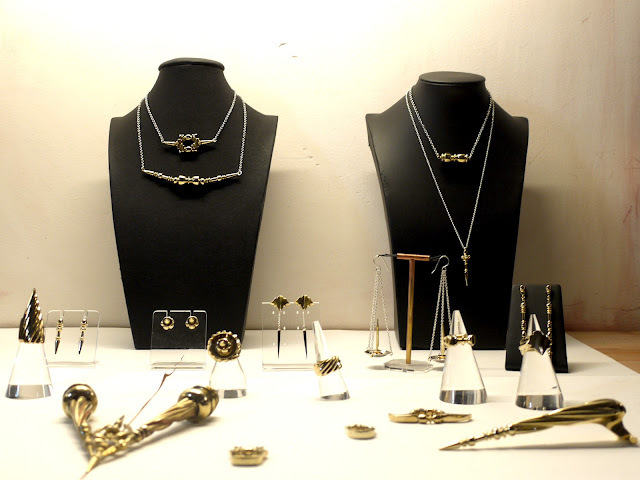 To that end he plated brass renditions of his sculptural work with gold and created punky-chic fashion jewellery that was more affordable than its shiny golden exterior suggested. 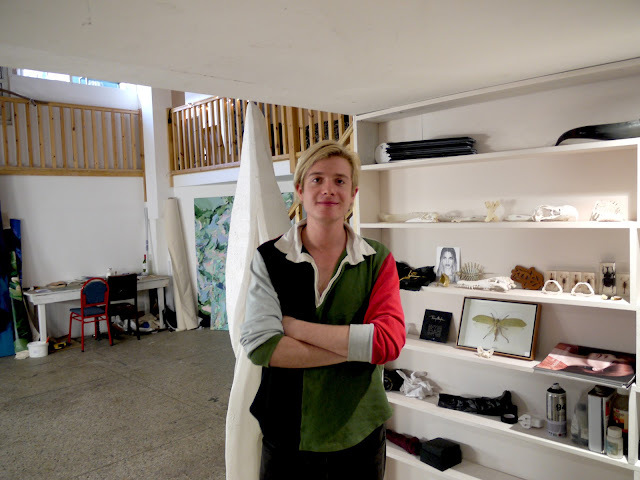 Fast forward to today and Dom, now on his sixth collection, is an older, wiser person and also a wildly successful young designer who has built an excellent business with global stockists - net-a-porter.com is his biggest retail customer - and a dedicated fan base of cool women and men of all ages. "I've cracked Europe, Japan, Italy and my next step is the States," he says. He has new projects too; a diffusion line "DJ" is due to launch next month, and in September he will debut a collaborative collection with Lady Amanda Harlech. Wow. I'm over at his Dalston studio which he shares with the two Toms: Tom Campbell, a painter who is in the only light-filled area of this basement apartment, and Tom Beard, a photographer and film maker who regularly works with Florence + the Machine. So how did he get from there to here? "Its funny, I have learnt my market now and it is not the customer I originally thought it would be," he says. "The woman I'm selling to is more like you - (he means a thirty-something career woman) - than Alice (he means Alice Dellal, the young punky model who gave him the seed money to get his business started)." So, now onto the new collection for Fall/Winter or Autumn/Winter, which goes on show at lunchtime today alongside a short film by Rafael Diallo starring Jessica Brown Finlay (Lady Sybil, from Downton, no less). This is significant, because also this morning a new jewellery initiative launches at London Fashion Week named Rock Vault, and Mr Jones is not taking part. Why? Dominic has made the decision to be a fashion jeweller; he wants to create two collections a year alongside the clothing collections, and show them at the London Fashion Week shows. "I was the first jeweller on the London Fashion Week schedule, and I'm proud of that." So what's the story for the Autumn/Fall range? 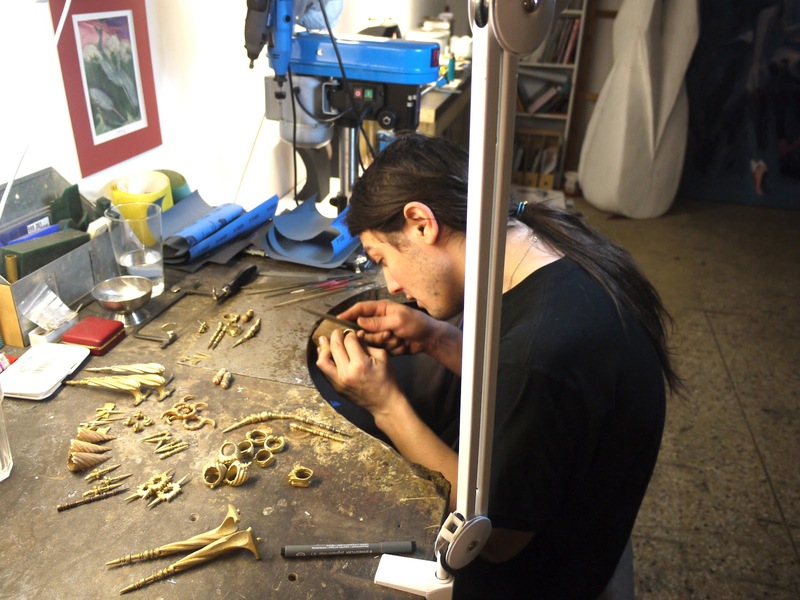 Dominic works with his hands and his heart. He is not one to spout words to deliver meaning or inspiration. A glance up on the walls of his studio tells one story. 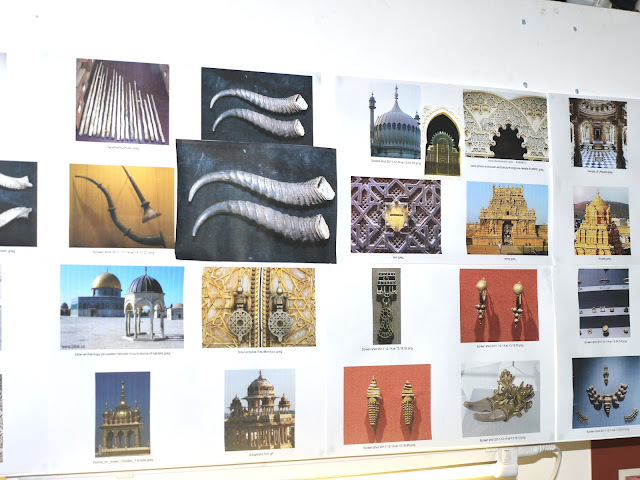 I see ancient images of Indian jewellery; Islamic Art, gnarled golden horns, spiralled antlers and Moorish architecture. Then I spot some new ink on the designers forearm. 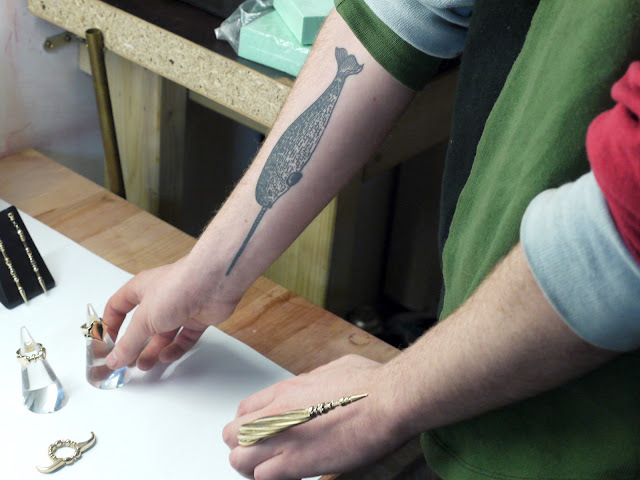 Its a narwhal, one of those incredible whales with a spear (well, actually a corkscrew shaped long tooth) for a nose. "My favourite film when I was a kid was "When The Whales Came", he says by way of explanation. Sure enough one of the spiral horn rings (worn between the fingers) closely resembles the narwhal tooth. Dom's latest tattoo, the narwhal inspired by his favourite childhood film "When the Whales Came"
"I'm loathe to mention specific references because in the end the work is more organic," he says. "I free form each piece by sculpting it in wax, I make it up as a go along." The tiny wax sculptures he shows me are beautiful; little works of art that instantly tell you they are by Dominic Jones. From these miniatures develops the collection, which for the Fall/Winter 2012 season includes crenellated miniature dome rings and matching earrings; Moorish graphics transposed into pendants, grooved horn rings and simpler corkscrew spiral bands. Making a return, albeit in spikier form, are his mini daggers that serve as pendants and dangle from fine chained necklaces. Just looking at it is enough to make me want several pieces, and I'm sure I am not alone in this. Dominic Jones shows his collection and film today at The Library, Two Temple Place, London WC2.